Crypto aggregator is a system that allows to combine Crypto currency trading data from biggest exchanges, as Bitfinex, Kraken, Gdax and Poloniex to a single price feed Realtime. 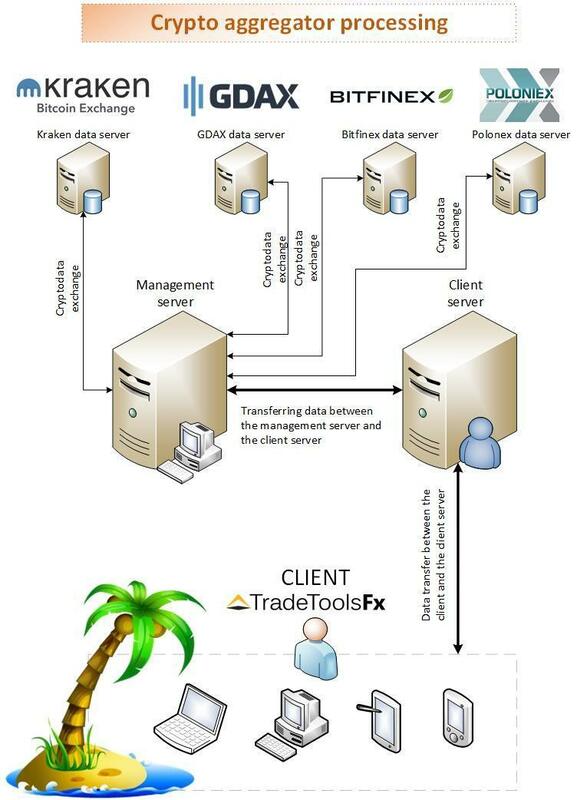 This is guarantees crypto-currency liquidity and allows to ensure uninterrupted trade without days off and holidays. Crypto aggregator is a software that allows to unite on a single site a large number of brokers and crypto-instruments and thereby to open access to the market of crypto-currency for a wider population. Crypto currency is aggregated from the largest exchanges Bitfinex, Kraken, Gdax and Poloniex, which guarantees crypto-currency liquidity and allows to ensure uninterrupted trade without days off and holidays. Can be used in Crypto Trading platform. Poloniex is called one of the largest exchanges of the crypto-currency market, the leader in most ratings by trading volume. The platform was registered in 2014 in the US, supports about 140 trading pairs and has 5387 online visitors daily. The main advantage Poloniex - convenient and easy to navigate. On one screen displays news, markets and chats. There is an opportunity to sort the market at once by several parameters: price, alphabet, volume, in addition, the user has tools for setting up selected pairs. - Reliability and security (two-factor authorization). Bitfinex is a Hong Kong platform that operates with three trading pairs (BTC / USD, LTC / USD, BTC / LTC) and provides an option for margin trading. Bitfinex has a simple Russified interface and requires strict verification of the identity when working with USD (an identity card that has a legal service, phone number, bank payment or bill for paid utilities). Bitfinex provides the possibility of simultaneous use of several order modes, removes up to 0.20% commission for trading operations and offers 0.1% for withdrawal and input of USD. - Funding - trading at the expense of investor funds, which are allowed to use for loans for a period of 2 to 30 days. Kraken began work in 2011 under the leadership of the founding company of San Francisco. It offers trading operations in fiat currencies (USD, JPY, EUR, GBP) and between crypto-currencies. - access to the third and fourth levels allows the user to operate large amounts by increasing the limits. GDAX is a platform created in 2016 in San Francisco for the placement and trade of Bitcoin and Altcoins. The exchange, covering the international market, offers users a two-stage verification and provides services for exchange, payments and transfers in crypto-currencies with the support of debit and credit cards.